If you've enjoyed our peek around the Fan Museum this month, then perhaps you might be inspired to have a bash at making your own? 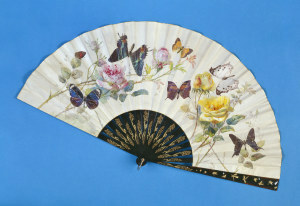 The museum runs fan-making workshops on the first Saturday of every month; as well as making Chinese and Fontange fans, there's usually a short history of fans given by the curator Mrs Hélène Alexander. Classes start at 2pm and cost £20 (booking ahead is highly recommended). You'll need to bring two sheets of smooth, non-shiny, wrapping paper with you but you'll get tea / coffee, biscuits (biscuits!) and the rest of the equipment in return. We can't promise you'll create anything as exquisite as the fan in the picture, but you should have a lot of fun. See other posts from October's Museum of the Month or vist them (or their website) at 12 Crooms Hill, Greenwich.